Don't swallow everything you read. 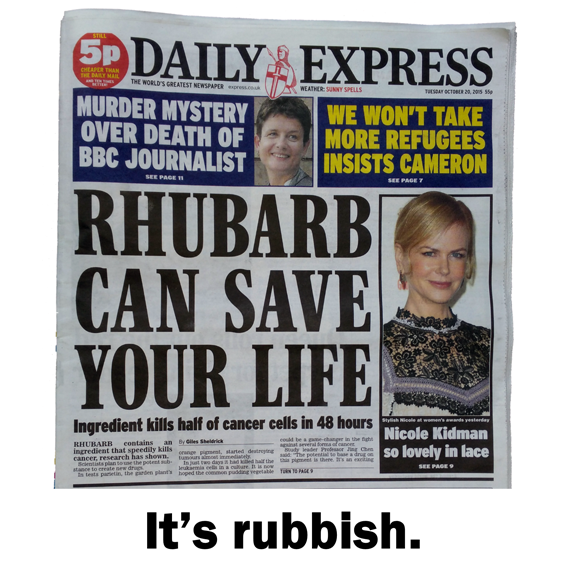 Today’s Daily Express front page shouted, ‘RHUBARB CAN SAVE YOUR LIFE’. But the claim turns out to be rubbish. But there are several problems with this story… and as usual, the truth is at the back-end of the Express article on page 9, rather than on their front page. (Which is why I always suggest that this newspaper’s stories should be read, literally, back-to-front). The story’s last paragraph quoted Dr Hayley Frend of Cancer Research UK, who sensibly put the rhubarb in its rightful place (in custard). When I phoned Cancer Research UK, their press office agreed with me that these types of stories just raise ‘false hopes’. The research into parietin – an orange pigment found in lichens as well as rhubarb – was undertaken by Winship Cancer Institute of Emory University in Atlanta, USA. But so far, they have only tested high-concentration doses of parietin in culture dishes and in mice. No human trials have yet taken place, so nobody knows yet whether the substance could successfully work as a treatment for cancer in people, let alone whether it’s safe. The online headline of this Daily Express rhubarb story claimed, ‘Cancer-killing drug made of rhubarb will be ready ‘within years’. But the truth is that even if parietin can be made into a drug (and at this stage nobody knows), it usually takes at least a decade to find out if a new drug will work and be safe. Only 1 in 5,000 new drugs ever make it to the market place. So, the Daily Express rhubarb story is, really, complete rubbish. There is no proof that rhubarb can save anyone’s life. An ingredient in plants such as rhubarb and lichens might one day be turned into a drug that could treat cancer, but such a drug doesn’t yet exist, it’s never been tested on people, nobody yet knows if it might be effective or safe, and even if it might be, it would take at least a decade until it’s available. From past experience, the chances that such a drug might one day become available is extremely low.